My kids finally find the Madagascar movies funny, and just in time for our Free App of the Day. Madagascar Preschool Surf n’ Slide offers young players 18 lessons in subjects such as numbers, shapes, and critical thinking. From DreamWorks Animation and JumpStart comes Madagascar Preschool Surf n’ Slide™, an immersive themed game, where players join young Alex, Marty, Gloria, and Melman, and the entire Madagascar gang for a slip-sliding adventure in learning! Players will surf down amazing slides as they learn multitudes of preschool skills on their mobile device. – 4 Madagascar themed levels: New York Zoo, Antarctica, Africa, and Madagascar Jungle! – Fast-paced arcade action going down the slides! Players start out choosing their favorite Madagascar character to play with and pick a ride to slide on from surfboards, to snowboards, magic carpets, and even friendly turtles! Players slide down one of four slides collecting stars and avoiding obstacles. 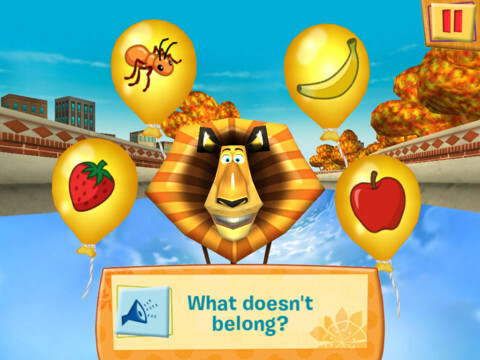 They will encounter balloon characters in each slide that will challenge them to fun learning games! As they play learning games, they will earn stickers for their sticker book! If you like the game, please take the time to rate it! Email us at AppComments@jumpstart.com with your suggestions and comments as we cannot respond to reviews. We love to hear your ideas and feedback! Like us on Facebook for exclusive updates, discount offers and news about our virtual world. Registration information is optional (children under 13 require parent registration). Will be used to notify of game fixes, updates, etc. along with allowing for future integration online.